Now that Honda’s standard 2015 Civic is on the road, have you found yourself waiting for the 2015 Honda Civic Si? If so, you’re not alone, but we have good news: you can drive home the 2015 Civic Si Sedan or Coupe from Central Illinois Honda Dealers. 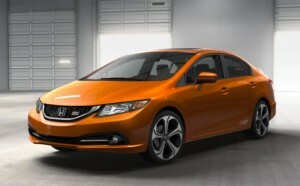 That’s right, if you’re reading this, you can own the new Civic Si! But what is it about Honda’s sport-tuned Civic that makes it so appealing? The Honda Civic Si has been impressing drivers since it debuted, and the 2015 model looks ready to keep up that status quo. Under the hood is a 2.4L four-cylinder engine with 205 hp and 174 lb-ft of torque—so that’s already a pretty significant departure from the standard Civic—and it just gets better from there. Both the Si Coupe and Sedan sport an exterior design with aerodynamic curves that not only make it easier to cut through the air but make it a beauty to look at. The rear decklid spoiler and alloy wheels give the Civic Si a stunning look that’s sure to turn heads, especially when it’s available in colors like Orange Fire Pearl, Dyno Blue Pearl, Rallye Red, and more. The interior is just as impressive, with red stitching, aluminum shift knob and pedals, and and a brilliant red glowing instrument panel. So, the Si has style and power, but it’s also got some of the latest in auto tech, including Bluetooth HandsFreeLink, Honda’s i-MID infotainment system, a standard rearview camera, SMS text messaging capabilities, and more. In short, it takes everything drivers love about the Civic, ups the performance and style, and lets it feel just as comfortable on the track is it does the morning commute. And we’re excited to have it in our new model showcase. We can talk about the 2015 Honda Civic Si all day, but the fact of the matter is that it’s been released now. It’s waiting for you here at Central Illinois Honda Dealers. And we would rather you get behind the wheel and see the Civic Si Sedan or Coupe for yourself. So stop by one of our locations near you.